For writer Alexandra Jacobs, moving to New York meant trading in a hibachi for a 165-pound smoker-roaster that requires as much attention as a newborn baby. 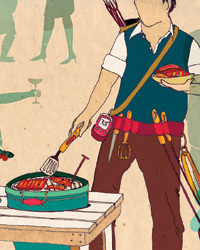 Like most stereotypical American men, my husband, Jonathan, has always ruled the family barbecue. And, fulfilling the corresponding stereotype of the female helpmate, I am usually left passing crudités to guests and making limp small talk to compensate for Jon’s absence as he prods endlessly at embers, brow furrowed. I’d like to say our attitudes became more enlightened when we moved from New York City to Los Angeles five years ago. But the only change was Jon’s growing grill envy. Everywhere you go in L.A. it’s grills, grills, grills. Just about everyone had a stainless steel behemoth proudly displayed on a spacious poolside patio. Since our house featured an enclosed porch but no lawn, Jon had to be content with a tiny hibachi on the asphalt driveway. Then one evening, while I was caring for our infant daughter, Jon attended a party at the home of a friend celebrating the acquisition of a dome grill. As the host explained to Jon, these large, ovoid-shaped devices have thick ceramic walls that retain heat well. (The best-known brand is probably the Big Green Egg; our friend’s was made by Primo.) Dome grills are very versatile: They can be used to cook food low and slow for 20 hours or more using a single load of charcoal—that is, they can produce Southern-style barbecue. They can also roast at 300 degrees or sear at 750 degrees. The dome lid and ceramic walls help seal in moisture, preventing food from drying out. The host of the party, a former restaurant cook who hailed from the north of England, displayed a foreigner’s particular zeal for Southern-American barbecue. He served succulent pulled-pork sandwiches to rival those of any Texas or North Carolina pit, complete with a half-inch-thick rosy-red smoke ring; intense, coffee-colored crust; and hardwood aromas of hickory, oak and apple. Soon after this revelatory experience, we moved back east to a Brooklyn apartment with—oh, the irony—a spacious backyard. As the real estate agent ushered us through sliding glass doors, visions of grown-ups sipping rosé while toddlers played Duck Duck Goose danced through my head. Meanwhile, it seems, Jon was envisioning a slightly less innocent fate for such game birds. All of these devices operate in basically the same way: They burn lump charcoal in a firebox in the base. The heat is controlled by opening or closing two vents, one under the firebox and one on the lid. The top vent also controls how much smoke stays in the cooker. 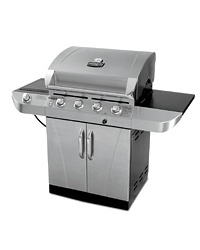 The grill’s main limitation is that it can’t change temperature rapidly, because the ceramic walls retain heat so well. In other words, going from 750 degrees to 200 takes some time. Yet each model has its proponents—one might even say its cultists. Jon was most attracted to the Grill Dome from a small company in Georgia. He liked the fact that the grill is manufactured in India and constructed on some of the same principles as the tandoor oven: It is earthen and porous and can withstand searing temperatures without cracking. The raves of devotees—who post pictures of their latest culinary masterpieces on grilldome.com—were the final incentive. Or so Jon told me, somewhat abashed, after a man unexpectedly showed up at our apartment one day struggling under the 165-pound weight of a large, extra-tall Grill Dome ($540, plus shipping), along with a special wooden table ($250) with a custom-carved hole to hold the new baby. “It gives you a work surface,” Jon explained. The hinges on our door had to be removed so the grill could get into the backyard; an acquaintance from college, who lived down the street and used to work on stage sets, helped transfer the formidable device into its new home and was rewarded with a cold beer and the promise of future feasts. I was mildly irritated by the purchase, but my pique faded quickly. The Grill Dome produced juicy, tender chicken and potatoes that recalled childhood campfires in Maine. Jon experimented with hot-smoking salmon at 165 degrees until it was flaky and permeated with alder smoke. He even produced a risotto flavored with smoked pumpkin. I couldn’t help noticing there was something feminine about Jon’s new style of cooking. Using the Grill Dome is far from the typical patio Daddy-O experience—or, as Jon now scornfully describes it, “dumping a bunch of coals, pouring lighter fluid on them, dropping in a match and then coming back in 10 minutes to throw on a burger.” Rather, the Grill Dome encourages a calmer, more thoughtful approach. Instead of charring a hunk of steak on a superhot grill, Jon now sears the meat in a cast-iron pan on the stove, then transfers it to the Grill Dome, which has been heated to 220 degrees. “I get a great crust, then slowly bring the steak up to a perfect medium-rare without overcooking it—all while infusing the meat with hardwood-smoke flavor,” he says. In the midst of a sticky August, we planned a barbecue involving an 18-hour pork shoulder. Jon stayed up until midnight making sure the Grill Dome was the proper temperature, exiting the sliding doors at what seemed like half-hour intervals to check the coals as I tossed and turned under the bedsheets. It was like having a newborn all over again. But the next day, about 25 friends and colleagues circulated through our dining room, gushing over the brisket, baked beans and, yes, pulled pork. After the success of that party, Jon’s devotion to his new gadget only grew. He lavished it with attention and accessories: first a paraffin fire-starter (basically, a block of sawdust mixed with wax) that he then replaced with an electric starter after he realized the former smoked too much; a long metal rod with a flat L-shaped end for scraping coals and ash out of the grill’s base; a cast-iron upper vent, because the ceramic one that came with the Dome can shatter if the top is lifted too abruptly; enormous silver barbecue mitts that go up to his elbows; and a remote- controlled thermometer that allows him to wander around the house with a beeper that chimes when the steaks are medium-rare, as if he were a doctor on call. Then there were the sacks of smoking woods (applewood, cedar, whiskey barrel—“some are chunks and some are chips,” Jon explained); the rubs from the Dizzy Pig Barbecue Company (Raging River, Tsunami Spin, Swamp Venom); the sauces (one of which I believe is called Bone Suckin’). It occurred to me that my husband’s exploits with the Grill Dome had become sort of the male equivalent of a visit to Elizabeth Arden, all massages and lotions and powders. Alexandra Jacobs is the editor-at-large of the New York Observer.